BITS and PC's - News From the Trenches! There's been a general outcry over the latest Chrome "Hotword Search" update that automatically installs a listening capability on your computer so Chrome can react to voice commands. This "OK Google" Search command "feature" had been available as an Add-on for some time before the recent controversial Chrome update was released. Similar voice search functionality has been commonly used on mobile phones for some time now, and with a welcoming reception: The Windows phone has Cortana, the iphone has Siri, and Android phones have "OK Google". Some of the strongest proponents of this recent across the board Chrome "Hotword update" as it is known, have referred to it as Google's "eavesdropping" device, saying that it enables Google to listen in on the conversations in your living room and send that "voice" data back to its servers for interpretation. Though I am by no means defending Google, I think that response is a bit too harsh and I'll describe why. First off, it's Chromium not Chrome that has had the reported installation configuration problems with the Hotword update , and the responsible voice integration module has since been pulled from the Chromium build by Google. Chromium is the open source version of Chrome and most of its users are using Linux or OS X based operating systems. The majority of Windows users use Chrome. If it isn't, UNcheck it! Not only does this "OK Google" search setting have to be enabled for your computer to be able to listen for the "OK Google" voice command trigger, but you must also have Chrome open to a new tab or the Google homepage (google.com) for it to work. After approval is granted, a big Microphone image appears on the screen temporarily, until Google finishes processing your search command. It may respond with a verbal answer, an appropriate webpage, or a combination of the two. 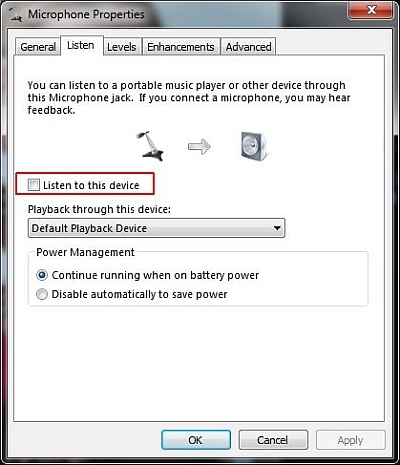 That covers all the requirements on Chrome's part, but additionally your computer must have a microphone attached that is turned ON with the "listening" setting enabled. Many desktops require an external microphone to be plugged in, while most laptops have an internal microphone. 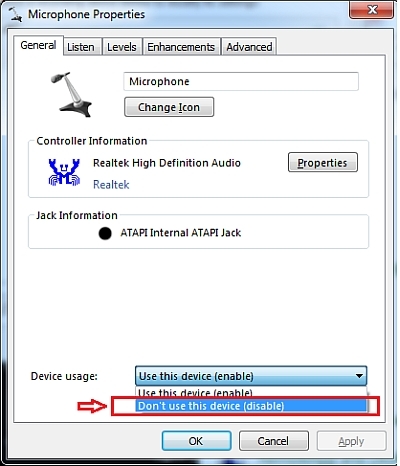 Whether your computer has an external microphone that may or may not be not plugged in, or an internal microphone, you can verify its configuration in the Control Panel. Open the Control panel and select Sounds. Your microphone will be listed there. On my desktop, the microphone is unplugged so it's "unavailable"
My laptop has an internal microphone that is turned on by default. Select the Listen tab and UNcheck "Listen to this device"
2. 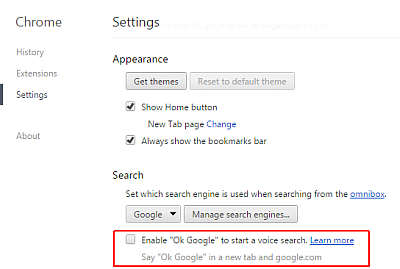 The "OK Google" voice search feature is NOT enabled by default and this can be verified in Chrome's Settings. For those that claim there may be a disconnect between what the Control Panel is reporting (the GUI) and the actual hardware setting, I invite you to test that theory. Iniate an "OK Google" voice search as I did above, by saying "OK Google" when Chrome is open to Google.com. If the "OK Google" voice search were surreptitiously enabled, despite what the Chrome settings claim, a series of events will ensue. You will have to approve its use of the microphone, and then issue a verbal search command, that it will then process. Nothing is hidden - its overtly obvious if "OK Google" is turned ON. Furthermore, it was Chromium not Chrome that had the reported configuration problems with the Hotword update, and that voice command module has since been eliminated from the Chromium build. 3. Computer hardware-wise, the "OK Google" voice search requires a microphone that's set to Listening "Enabled" for it to work. 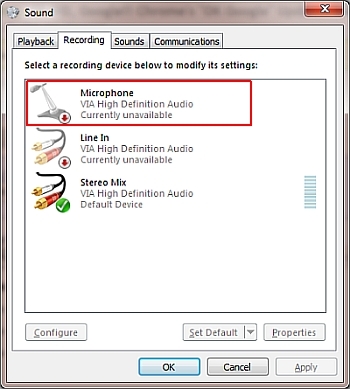 If your computer has a microphone, you can also check your Microphone Setting in the Control Panel to determine if it is turned on to active listening. 4. All of these configuration requirements can be checked via Chrome's settings and the Windows Control Panel settings. So all the stars have to be aligned, meaning a few things must happen in both hardware and the software for the "OK Google" voice search to be active. The way the responsible Hotword update is installed by Google Chrome, it is automatically set to be disabled by default. Therefore, although Google, Inc can be criticized for leaving Chrome users uninformed of this newly added Voice search capability, it is far less nefarious than some of the media has made it out to be. There are a number of ways that I've enumerated above, to verify that the "OK Google" voice search is NOT turned on, and if you don't believe what the Chrome settings report, then test it out yourself like I did.